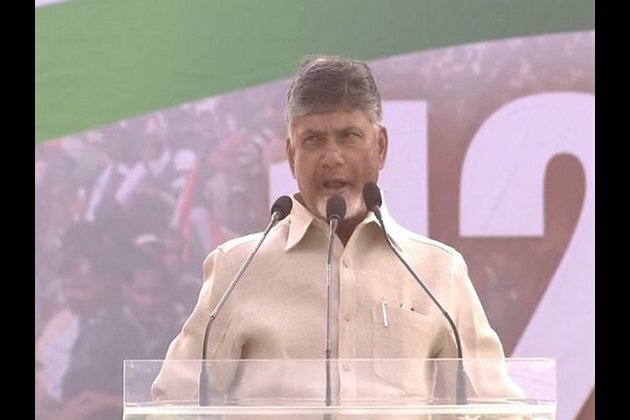 Kolkata (West Bengal) [India], Jan 19 (ANI): "Narendra Modi is a publicity PM, we want a performing PM," said Andhra Pradesh Chief Minister Chandrababu Naidu at the mega opposition rally in Kolkata organised by West Bengal Chief Minister Mamata Banerjee. "Five years ago, people gave the mandate for the BJP. They betrayed the nation. They gave slogans. Jan Dhan, mudra loan, good governance, smart cities, bringing back black money, two crore jobs, acche din. These are all slogans. None of these have been fulfilled," he pointed out. "He (PM Modi) promised that the income of the farmers will be doubled but in reality, farmers are still reeling under the poverty, they are not getting Minimum Support Price and are also committing suicide due to weak policies. The agricultural growth rate of the country has also slowed down," Naidu added. "BJP wanted to divide the country but we all are here to unite it. The BJP has betrayed the nation despite getting the full mandate," he added. The Andhra Pradesh Chief Minister also took a jibe at the Centre over the Rafale fighter jets deal, saying: "They have misled the nation on this issue too. They also misled the Supreme Court by filing the wrong affidavit. They have only bought 36 Rafale jets with a large sum of money. They are betraying the nation in a big way." "Not only that, the present government is also misusing their powers by influencing premier institutions like CBI and ED," he added.